Welcome to coral reef ecology! In this unit, we will learn about what ecologists study and how it applies to coral reefs. In 1866, German scientist, Ernst Haeckel, coined the term , which he wrote as ”oekologie,” stemming from the Greek word “oikos.” He was also a naturalist, zoologist, physician, professor, philosopher, and artist who discovered, documented, and named thousands of new species. He coined many other terms including anthropogeny, phylum, phylogeny, stem cell, and the kingdom Protista. 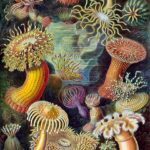 Haeckel published over 100 illustrations of animals including many marine organisms. Overall, Haeckel had many contributions to science. To see more of Ernest’s work click here. 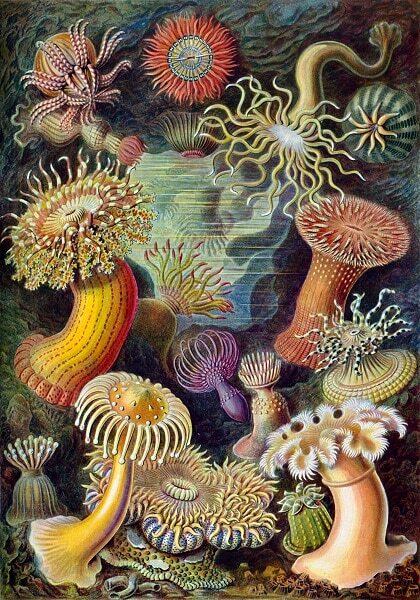 Source: Ernst Haeckel [Public domain], 4 March 2006 via Wikimedia Commons. https://commons.wikimedia.org/wiki/File%3AHaeckel_Actiniae.jpg. So the word ecology translates to the study of the home. What’s in your house? Can you categorize all of the items you listed as either living or non-living? The answer is yes. Pets, plants, and family members are all living things. 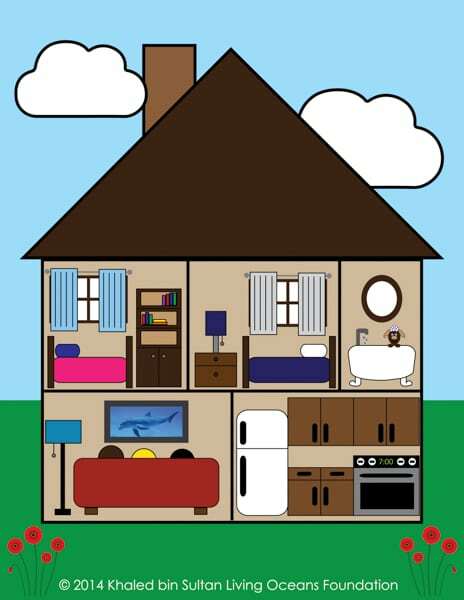 TVs, couches, beds, water, air conditioning, radios, cooking utensils, and books are all non-living things (figure 1-1). Who cares if there are living and non-living things in your house? You should! If your house didn’t have electricity or running water, how could you cook your meals or take a shower? This interaction of you (living) and the non-living things in your house is all part of the definition of ecology. Ecology is the scientific study of the distribution and abundance of life and the interactions between organisms (living) and their natural environment or home (non-living). Therefore, abiotic means without life. Abiotic factors are non-living components of an organism’s environment. What do you think biotic means? It means life. Biotic factors are living or once living components of a community. The study of ecology encompasses more than all of the living plants, animals, bacteria, and the non-living things like rocks, soil, sunlight, weather, temperature, and water. It also describes how the living and non-living factors interact. Ecology also includes processes such as photosynthesis, cellular respiration, and relationships like mutualism and commensalism (Unit 4: Coral Feeding); reproduction (Unit 5: Coral Reproduction); life cycles (Unit 6: Life Cycle); distribution (Unit 7: Distribution); adaptations and evolution (Unit 13: Evolutionary History); diversity, abundance, and populations (Unit 14: Biodiversity, coming soon); interactions such as predation, energy movement in a system, and food web dynamics (Unit 17: Food Web Dynamics, coming soon); and natural and man-made influences (Unit 19:Threats, coming soon). Ecology also includes knowledge about the past, present, and future. Ecology is a branch of biology, a natural science concerned with the study of life and living organisms. As we have learned, there are a lot of different topics in this branch of science. Often, ecology is referred to as a multidisciplinary science, which means that other branches of math and science are used to aid in studying and understanding ecology. These include architecture, biology, biophysics, chemistry, climatology, engineering, geology, mathematics, mechanics, and physics. For example, ecologists must use chemistry to help understand chemical cycles such as photosynthesis or the formation of sulfuric acid in volcanic vents. Mathematics is central to ecology and helps us measure things like population size, biodiversity, energy transfer, and distribution of species. Figure 1-2. 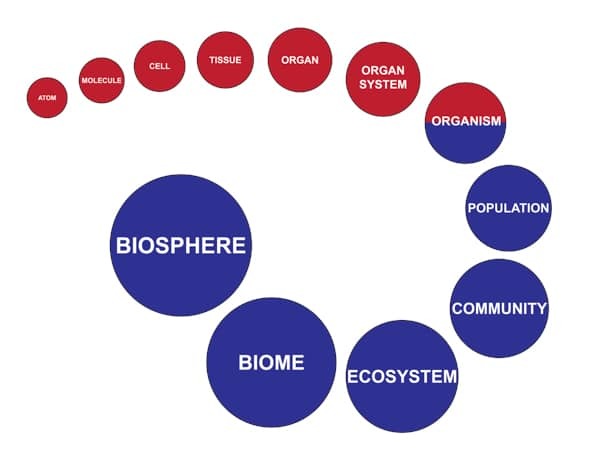 The red circles represent levels of biology and blue circles represent levels of ecology. Notice that the levels are arranged from smallest (atoms) to largest (biosphere). Hydrogen (H) and oxygen (O) atoms exist as individual atoms (figure 1-3). When two hydrogen atoms combine with one oxygen atom, they form a water molecule (H2O). The water molecule is more complex and stable than the individual atoms. A molecule emerges from atoms. Multiple butterflyfish that live in a defined area are part of a population. When other species of organisms, like coral, live in the same defined area, they are part of a community with butterflyfish. Some butterflyfish feed on coral. In this example, the emergent property is predation. Due to the complexity of ecology, when we study it, it’s easiest to organize it into different levels. There are six levels of organization in ecology (figure 1-2; blue circles). Notice that we begin with organism, which is very specific, and continue to biosphere, the broadest description. 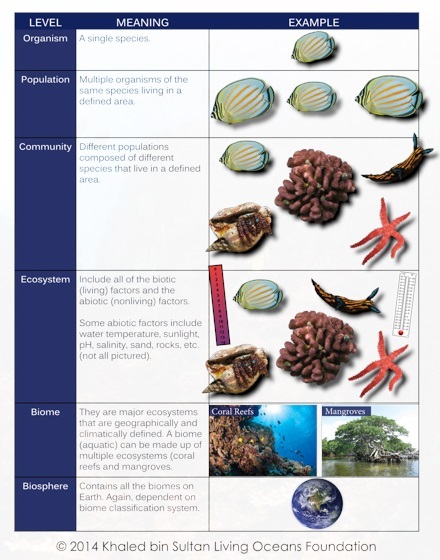 Ecologists study each ecological level from the individual organism to the entire biosphere and how each of these levels is interconnected (figure 1-4). The first level of ecology is organism, which is most specific and deals only with a single individual. The second level builds onto the first and consists of multiple organisms of the same species that are living in a defined area. This is called a population. The third level of ecology is called a community. In this level, there are several different populations composed of different species living in a defined area. In the fourth level, ecologists are now taking into account the biotic and abiotic factors of that environment; together they all form an ecosystem. The fifth level is called a biome, which consists of several different ecosystems that are geographically and climatically defined. On Earth we have 5 main types of biomes: aquatic, desert, forest, grasslands, and tundra. The final level of ecological organization is biosphere, which contains all the biomes on Earth. Using a coral reef ecosystem as an example, let’s look at the ecological levels of organization (figure 1-4). In the first box, we have a single organism – the butterflyfish. Next, a group of butterflyfish makes up a population. 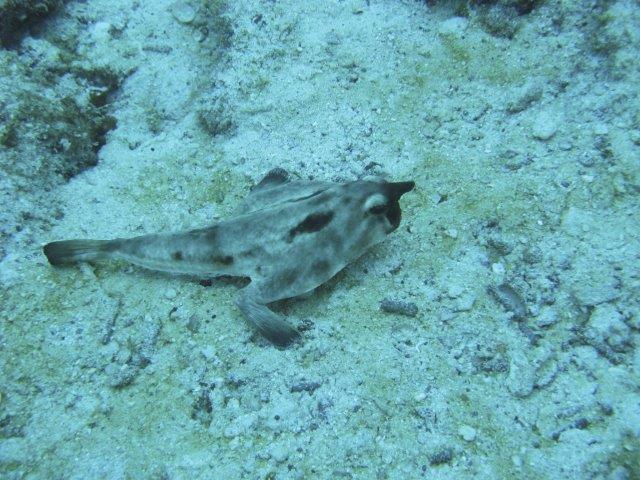 A community could consist of butterflyfish, hermit crabs, corals, starfish, and even sea slugs. Finally, this ecosystem would consist of the living organisms just mentioned, but it would also include abiotic factors such as water temperature, pH, sunlight, salinity (amount of salt in the water), and even water currents (not all pictured). A coral reef ecosystem would be a part of the aquatic biome. This biome is just one of many that make up the Earth’s biosphere. Coral reefs are classified as ecosystems. In the following units, we will be discussing the living organisms and the non-living environment, processes, mechanisms, and relationships that make-up the coral reef ecosystem. Figure 1-1. Poppies By Liz Aragon [CC-BY-NC-SA-3.0 (http://creativecommons.org/licenses/by-sa/3.0] 30 May 2012 via Sweet Clip Art. http://www.sweetclipart.com/red-poppy-flowers-957. Figure 1-4. Earth By Azcolvin429 (Own work) [CC-BY-SA-3.0 (http://creativecommons.org/licenses/by-nc-sa/3.0)] 21 January 2013 via Wikimedia Commons. http://commons.wikimedia.org/wiki/File%3A1_Earth_(blank_2).png. Figure 1-4. Thermometer By Teacher Files [CC-BY-NC-SA-3.0 (http://creativecommons.org/licenses/by-sa/3.0] n.d. via Teacher Files. http://www.teacherfiles.com/clip_art_thermometers.htm.